Sury Martín frowns at her worksheet. The top of the sheet reads “Fire,” and there are nine panels underneath, each one illustrating a different scene of a man discovering a house fire and trying to get help. Martín’s instructions are to explain to her partner in English what is happening in each panel, but it’s difficult to decipher the illustrations. The man looks upset, but where is he running? Why is he leaving his home? The teacher of this English class has strategically paired students together who don’t speak the same native tongue, and Martín, who speaks Spanish, and her Arabic-speaking partner struggle through the exercise, flipping over the sheet to an even more confusing scenario, a “prowler” entering the house. But to 24-year-old Martín, struggling through confusing illustrations is worth it. “Me metí a aprender el inglés porque estoy en un país donde es necesario,” she says—she wants to learn English because she is in a country where it’s necessary. And more than anything, she wants to succeed. Martín came to Oakland from Guatemala a year ago, and she is learning English through this class at Oakland International High School (OIHS). Every day, Monday through Thursday, Oakland International holds two sessions of English classes for Oakland parents. Her five-year-old son is enrolled at Global Family Elementary, a bilingual school within Oakland Unified School District (OUSD). She wants him to be bilingual; she doesn’t want him to lose Spanish. Martín has met other children, she says, who have focused so much on learning English that they forget their native language. And like her son, she’s going to school so that she can become bilingual, too. Learning English has been difficult, and she wants more than anything to be able to platicar, or chat, and have long conversations with other people. She’s encountered people who think she’s conceited for not answering if she doesn’t respond when they speak to her in English. “Pero no,” she laughs, a little sadly. It’s not that; she just doesn’t understand what they’re saying. Her son will sometimes speak to her in English, and when Martín asks him to repeat it in Spanish, he tells her that she needs to practice. But while Martín often feels isolated linguistically, Oakland is home to many other Spanish speakers. Her son’s teachers all speak to her in Spanish, and, since the student body of Global Family Elementary is 82 percent Latino, many other parents at the school do, too. And the student body at OIHS, the high school in the Temescal district that hosts Martín’s classes, is even more diverse. One hundred percent of the students are English Language Learners and newcomers, or recently arrived immigrants. Approximately 32 countries are represented among the home countries of the student body, and about 30 different languages are spoken amongst all students. When they first enroll at OIHS, students must have been in the United States for no more than two years. For the last two years, enrollment for ninth- and tenth-graders at OIHS has been maxed out. Paw Sei is also in Martín’s English class. Originally from Burma, she has been in Oakland for four years, and is the mother of seven students who attend district schools. “That’s why I’m so tired!” she laughs, after a meeting for Burmese parents at OIHS. A small boy in a green Teenage Mutant Ninja Turtles t-shirt tugs at her sleeve while she speaks, saying “Let’s go!” over and over again. Sei speaks Karen, one of the languages spoken in Myanmar (alternatively known as Burma). She can say basic phrases in English, and helps her Karen-speaking friends in English class. But, unlike Martín, whenever she needs to talk to a teacher, she says, she needs an interpreter. The meeting had been a chance for parents to hear about summer school opportunities, go over their students’ grades and transcripts, and play a team-building volleyball-type game. Throughout the whole presentation, Hsar Htoo, an Oakland parent hired part-time by the district-run refugee and asylee student assistance program, translates for the room of mothers and fathers. While most of the attendees speak Karen, two speak Burmese, which means that Htoo has to do a double translation. Both Martín and Sei are part of a rapidly growing number of district parents who don’t natively speak English. According to OUSD’s fast facts website, during the 2014-2015 school year, 49.5 percent of students in the Oakland school district spoke a language other than English at home. Fifty native languages are spoken throughout the district. And while the district’s translation department, refugee and asylum program and community engagement specialists are racing to keep up, 50 languages is a lot on a limited budget. Communicating with parents and families, though, can have life-long implications for students. Studies show that when parents are engaged in their children’s schools, their children are more likely to do better academically and are more likely to graduate from college or from another post-secondary institution. But parents who don’t speak English may not feel like they are able to participate in school activities or speak to teachers if a linguistic barrier exists, so translation services are crucial. While the city of Oakland has always been diverse, the number of newcomer families has recently increased dramatically, doubling in the last three years. “For ten years or so, up to a couple years ago—I think due to the recession—there was a real drop in new immigrant families,” says Nicole Knight, English Learner Executive Director of OUSD, who has been with the district for 17 years. In 2013, though, Knight and her colleagues witnessed a reversal in this trend, as unaccompanied minors—children under the age of 18 who are separated from their parents and are seeking asylum in another country—and migrant families fled violence in Central America. Alameda County, which includes Oakland, received the second-highest number of unaccompanied minors in California, with Los Angeles taking in the most. 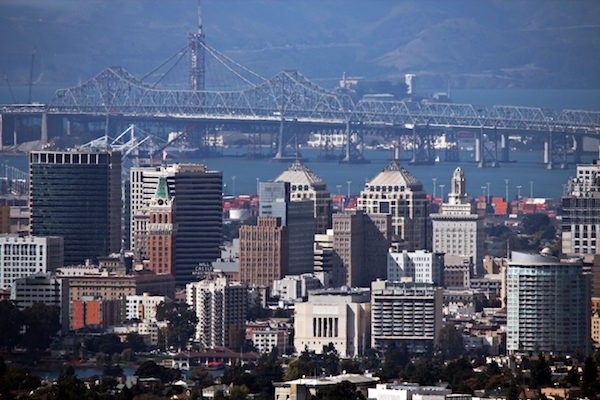 Oakland is also a popular destination for migrant and refugee families: It is a sanctuary city, a place that helps to protect undocumented residents from deportation, and also is home to one of the four California offices of the International Rescue Committee, an international organization that helps refugees fleeing humanitarian crises. Because of these ever-changing ebbs and flows of migration patterns, the district has to evaluate need when hiring translators or community navigators. “Arabic is a big gap in the district,” says Nate Dunstan from the school district’s refugee and asylee program. The district employs one Arabic translator, but Dunstan says it’s not enough to meet their current need, especially for last-minute appointments or meetings. Translation plays a crucial role in many different arenas within the school system, and schools have also been adapting their systems to accommodate parents. At Garfield Elementary, parent-teacher conferences are often a multi-person affair, with translators present for any meetings in which parents and teachers do not speak the same language. Jamie Lopez, managing director of Garfield Elementary’s partner organization, the East Bay Asian Youth Center (EBAYC), starts preparing the translation for parent-teacher meetings two weeks before they actually take place. She draws up a chart, listing the meeting times of every student for each the 25 teachers at Garfield. In a column to the right of students’ names, she writes the language spoken at home, and then in another adds the name of a translator available at that time. Spanish takes up a large portion of the boxes in the language column, but Vietnamese, Khmer, Karen and Cantonese are also there. The translators at these meetings can be official district translators, faculty, staff or outside volunteers. Many of the volunteers are former after-school program staffers, who are invested in the school. “It’s a big, huge jigsaw puzzle trying to nail down the needs of the classrooms and the availability of the volunteers,” Lopez says, “and then trying to make sure it all fits the schedule.” When she can’t find an appropriate translator, a teacher will use Language Link, a phone interpreter service that translates languages for 62 cents per minute. But technology can only do so much. Language Link is “great, it’s wonderful,” Lopez says. But it doesn’t allow for one-to-one meetings that can help forge a parent-teacher bond or make parents more comfortable with asking questions of the teacher. She wishes that they could have a full-time Spanish-speaking translator on staff. “I think folks think it’s easy, but it can be a full-time job just to do the translation coordination here,” she says. As the newcomer population has increased, the demand for translation has too. And with the increasing demand, the translation services department has to add positions and professionals who speak new languages that have entered the district. Right now, the district has five positions for Spanish translators—two are currently vacant—two Chinese translators, one Vietnamese translator, one Arabic translator and one part-time Cambodian translator. When a parent who speaks another language needs translation, Angel Ho, the head of translation services, contracts to an outside company. As a response to the increasing demand, in 2013, the OUSD school board officials updated the educational code regulating translation services provided in the district, “ensuring that, consistent with the law and to the fullest extent practicable, English learners and parents who speak languages other than English are provided translation and interpreting services, when necessary.” As the code reads now, if 15 percent or more of the students at a school primarily speak a particular language other than English, the school must translate all written notices that go home—flyers, permission slips—into that language. Additionally, any communication or documentation regarding one specific student must be translated into the language understood by the parent or guardian, no matter what percentage of families within the school’s community speak that language. As with Garfield Elementary’s one-on-one conferences, group translation requires careful planning, too. For the past 20 years, translators from the official OUSD team have appeared at every school board meeting, which take place every other Wednesday night. Four translators sit at the tables right by the front entrance; they are the second thing you see when you walk in, after the police officers. Four black trunks with the edges outlined in silver sit open in front of them. Inside the chests are dozens of audio devices neatly arranged in rows. When people need translation help, they stop by the table, pick up a device and secure it to an ear. At this February 24 meeting, two charter schools are petitioning to renew their contracts with the district, and the families of students attending these charter schools always turn up en masse at school board meetings to show support for their schools. After spending two hours glancing at the door and cursorily scanning the audience for Spanish or Chinese-speaking parents in need of translation, the table finally has visitors. A flood of visitors. The translation team springs into action, with Lesbhia Morones and David Yuen taking the first shift, stationing themselves discreetly by the main stage and speaking into little microphones as they translate what the school board members are saying into Spanish and Chinese. Cynthia Ovando and Angel Ho man the tables, greeting families, asking if they need equipment and handing out audio devices that are connected to the microphones in Morones and Yuen’s hands, transmitting the translation to the listeners’ ears. Each language has its own channel. Usually, Spanish translation is in much greater demand at these events, but today, Yuen and Ho are kept busy. American Indian Model Schools (AIMS) is one of the charter schools petitioning to renew their contract, and AIMS has a majority Chinese American population. In addition to school board meetings and the written translation they do under the district’s 2013 amendment, Morones, Ovando and Yuen will oftentimes translate for Individualized Education Plan (IEP) meetings, which are used to set specific goals for students in special education programs. These meetings are a crucial step for students to receive the help they need academically, and parents need to understand what is being said. “Navigating your child through special education is challenging for any parent,” Ovando says. “And to work with their child and to have identified disabilities that range in severity—it’s difficult for English-speaking parents.” The documents used at IEP meetings are full of educational jargon, and for parents who don’t speak English, the difficulties are doubled. At these meetings, linguistic translation may not be enough, and translators may have to step out from being behind-the-scenes. “It’s a hard position because you need the language of the institution translated, not just the words,” Molina says. “There’s a ‘parent ed’ component to being an interpreter.” Part of parent ed includes cultural translation, and requires a translator to understand a parent’s cultural background. “Learning how to speak to the parents and understanding what they will or won’t respond to is really important,” says Michelle González de Jesús, a social studies teacher at Fremont High School. And different cultural groups have different linguistic needs. Back in 2008, for example, Oakland saw an influx of Nepalese migrants, due to political unrest in Nepal. But, says Dunstan of the district’s refugee and asylum department, many members of this community had learned English in refugee camps in Nepal, and didn’t need much in the way of translation. Among the Afghani immigrants in Oakland, Dari and Pashto are the two most commonly spoken languages. “But most of those families have a father that speaks fluent English, and he’s able to translate everything to do with the school,” Dunstan says. But school board meetings are always important for translation. Though the translation team’s jaws may be exhausted after a six or seven-hour meeting, they are a vital link: allowing information to flow back and forth, and allowing all parents, regardless of their native language, to be involved in the decisions of the school district. At the February meeting, by about 7:46 pm, Morones has already been on her feet and translating at the front of the room for half an hour. Ovando taps her colleague’s shoulder to relieve her. The parents outnumber the seats, and they line up along the side of the room, leaning against the beige padding that cushions the wall. At least one person in each row of chairs has an audio piece in his or her ear. Two or three or four children cluster close to their parents’ legs if they’re standing up, and sit alongside them if they’re seated. The school board members are now discussing charter school performance metrics, a conversation that does not seem to captivate the youngsters’ attention for very long, and soon they are roaming the aisles and giggling to one another. A boy of about two, hanging limply across his mother’s lap, snores in the fifth row. A mother of a sixth grader from AIMS takes the stand, and she begins to speak in Spanish. The school board directors grab the audio devices in front of them as Morones switches to Spanish-to-English translation for the board. They nod their heads as the woman speaks to them through Morones’ voice. Morones says the district has changed a lot since she first began to work for OUSD. “The district is moving towards having the parent voice really, really heard,” she says. The challenge now, she says, is making sure that parents understand all the services available to them. But many parents, like Martín and her classmates at OIHS, one day want to be able to communicate independently of any translation services, both within schools and without. On a Thursday morning at OIHS, a group of adult students furiously copies the sentences written on the board. The 10 women and one man in the room hail from Guatemala, Eritrea, Yemen, Cambodia and Burma, among others. But they are all here for a common purpose: to learn English in order to better navigate systems in the United States. To achieve citizenship and to go to college. To be able to speak with doctors and bus drivers and teachers. The 11:45 class is more advanced than the earlier section, the one Martín attends, and involves more conversation and writing. They recently wrote an essay in response to the question: “What was the scariest thing you ever did?” and the sentences on the board, taken from these essays, aren’t grammatically correct. What’s wrong with this, the teacher asks the still-copying group, pointing at “I have a scary.” A woman in the front row tries to re-order the sentence, but she is stumped by the verb tense. “The question is in the past,” the teacher says, crossing out “have” and writing in “had.” Her pupils immediately put their pencils back to their papers, imitating their teacher. The teacher, who has told them they don’t need to copy all that she does, gives up trying to prevent their dutiful actions, and smiles as she waits for them to finish. Parenting in another country can open a whole other set of difficulties unrelated to language. “Here, the children just want to eat hamburgers, pizza, junk food,” says the woman with the Mickey Mouse shirt. “I don’t like this kind of food, I like to cook my own food.” In Guatemala, she never ate junk food. And girls here, she adds, will spend all their time shopping or hanging out with friends. “Let me ask you this,” says the teacher with a teasing grin. “In your country, did you do that?” A murmur of laughter ripples through the classroom, but the woman doesn’t back down. In her country, she lived in a smaller town, and it wasn’t dangerous. Here, she says, if her daughter goes over to a friend’s home, she doesn’t even know the friend’s parents. A mural at Oakland International reflects the diversity of the school. It was difficult to put this article aside, once I started reading it, I could not stop! This article is insightful, inspiring and full of hope for our English learners both young, old, single, parents, non-parents, etc. I found it inspiring because it has brought up volumes of experiences for me as an immigrant now US citizen, living in the US since 1961. Wowk, it touches the surface on so many aspects of our new life in the US. Aspects of a variety of dimensions that are worth exploring! I am inspired to reflect and explore these dimensions personally and with my family members. How??? That is THE question. A special thank you to Srta. Erika Alvero for the gift to your words.